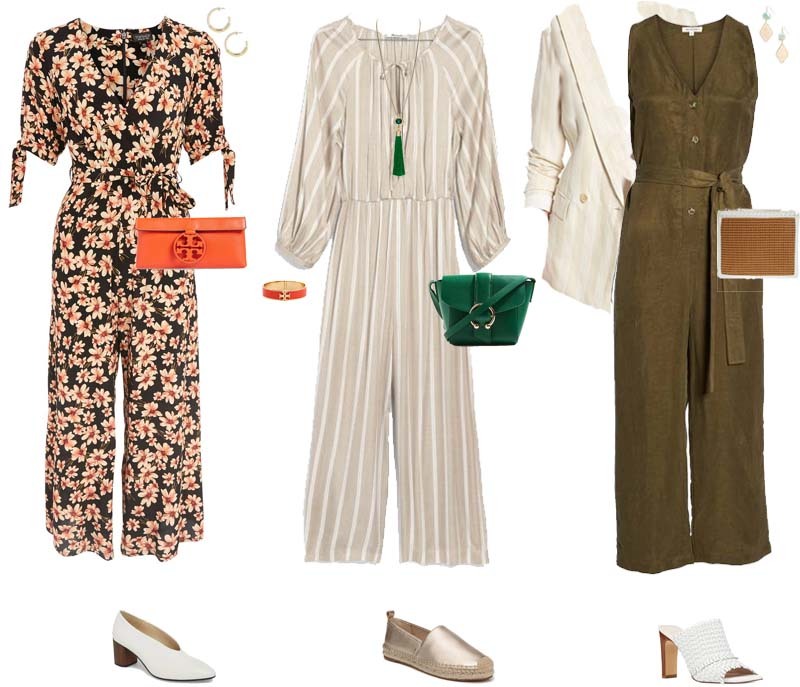 40+ Style » What to wear » The best summer jumpsuits for women in stores now – Which one is on your wishlist? 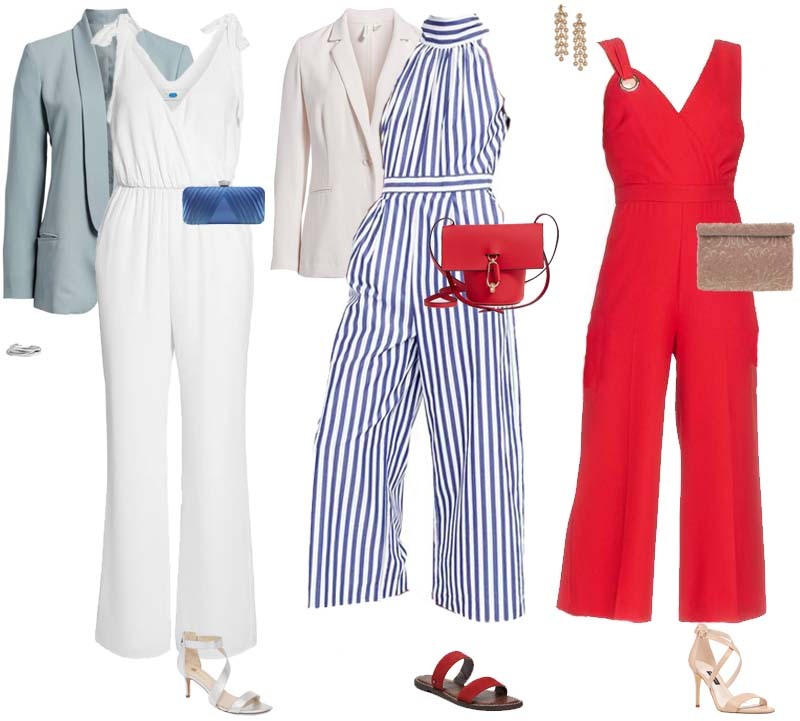 The best summer jumpsuits for women in stores now – Which one is on your wishlist? Everyone who knows me knows I’m a huge fan of jumpsuits. I wear them no matter what time of year. 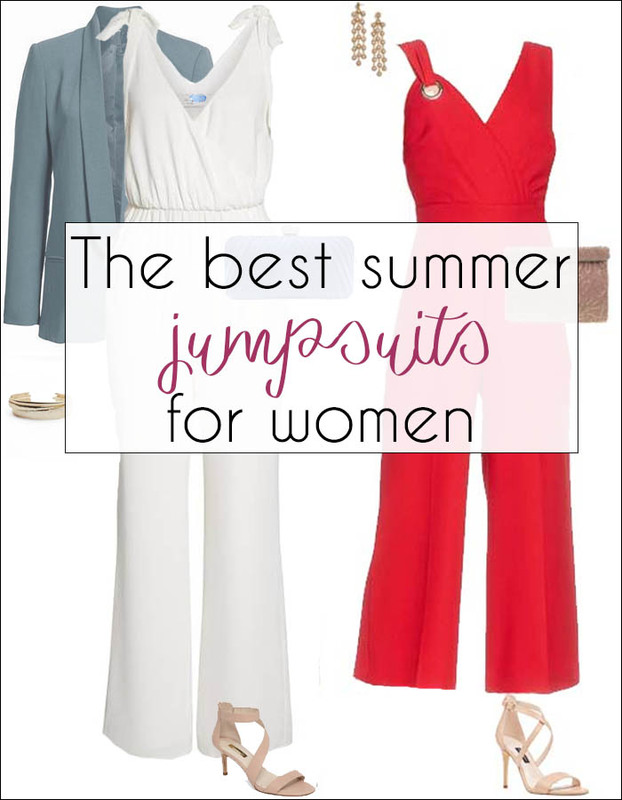 Today I’d like to share some tips and ideas for wearing summer jumpsuits with you and show you some of the best jumpsuits for women available in stores now. What’s not to love about a jumpsuit? It’s an outfit all-in-one. There’s no worrying about whether the top goes with the bottom. You just throw it on, and off you go! Plus, you can wear jumpsuits for any occasion. Throw on some sneakers with them for casual days, pop a blazer over the top for more formal occasions and wear with heels for a night out! There are also some beautiful floral jumpsuits in stores that I have my eye on for summer weddings and barbecues! 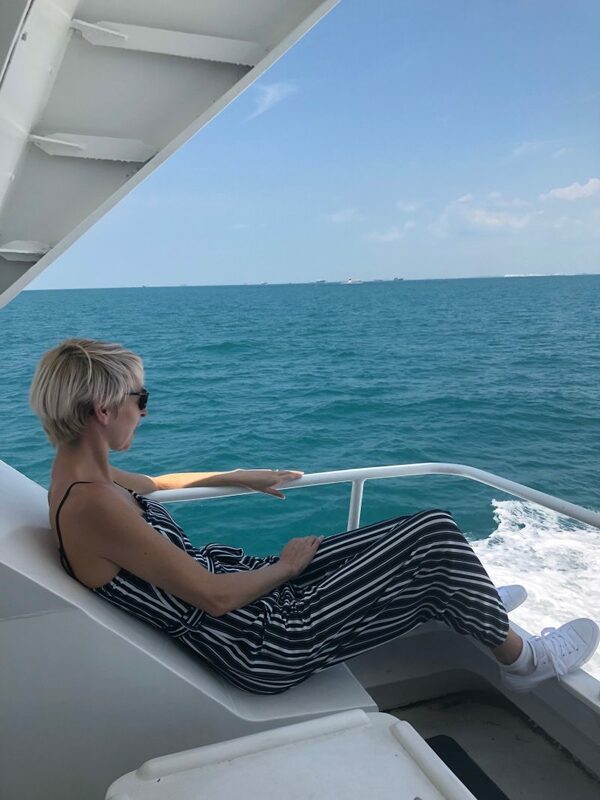 If you’re a jumpsuit newbie, then here are five tips to help you dip your toes into the waters. Try on a few until you find the perfect fit. 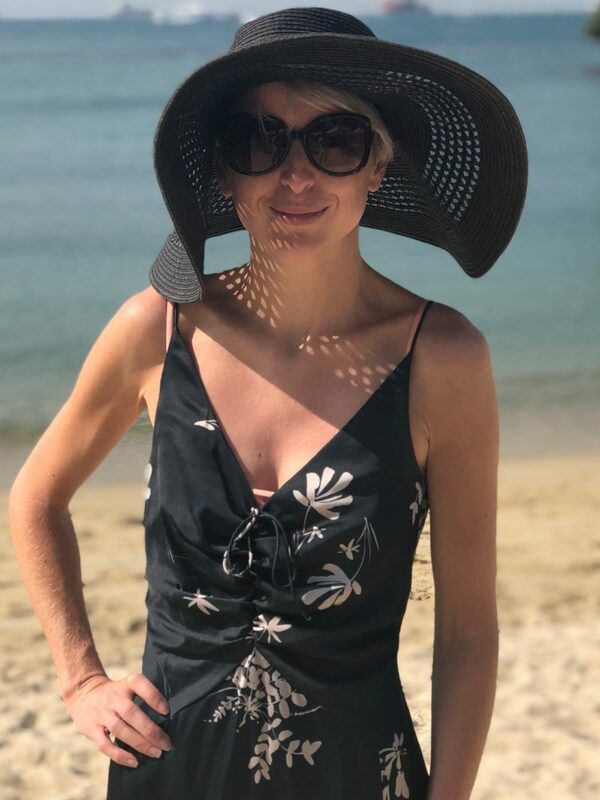 It is harder to find a perfectly fitting jumpsuit than many other items of clothing, as you need one where the waistline is on, well, your waistline, and the crotch isn’t sitting too low, unless you opt for a harem jumpsuit like Sylvia does here! Look for jumpsuits with adjustable straps as these help you to alter the fit to your body. Define your waist. Many jumpsuits have a cinched-in waist or a belt so you don’t lose your femininity even though you’re wearing an all-in-one. Pair with a blazer. This can add lovely long lines, breaking up the look of your jumpsuit with an additional layer. Wear a solid color. 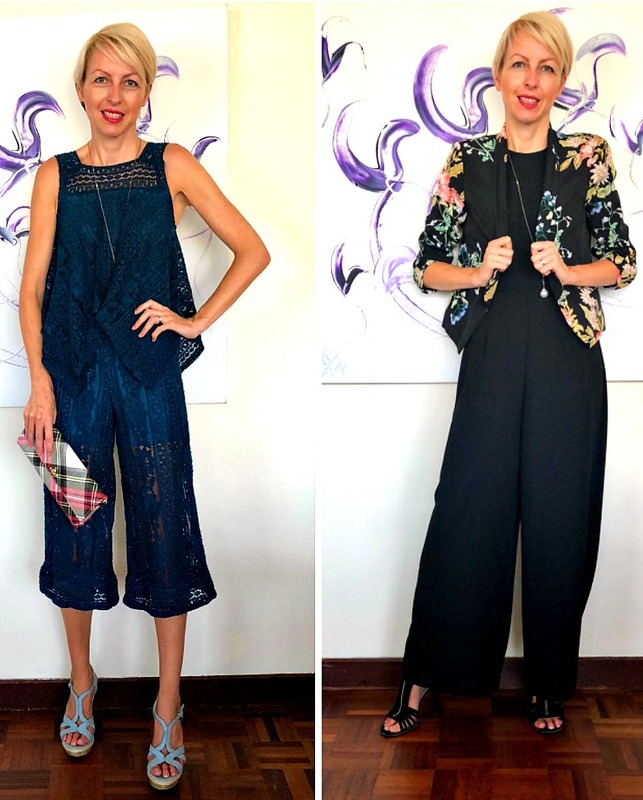 If you’re new to wearing jumpsuits than you will probably feel more comfortable in a solid color like navy or white than you would wearing a lot of pattern. Wear a wide leg jumpsuit with heels to make your legs look like they go on for days! Heels can also elevate your jumpsuit into a look you can wear for formal events. While white no doubt adds an instant feeling of summer to your wardrobe, it can also be tricky to wear because it doesn’t have the same slimming properties as darker hues like navy or black. But, by adding a long-line blazer as a top layer like the blue blazer over the white jumpsuit in the look above, you can elongate your silhouette by creating sleek, long lines. This can skim over any problem areas such as your tummy and hips. You’ll also be able to cover your upper arms this way if you don’t feel comfortable showing them off. When looking for a white jumpsuit, the key is to go for quality fabric to ensure that you aren’t inadvertently flashing your underwear! Another idea, if you’re not ready for all-over white is to choose stripes! A jumpsuit can be a beautiful alternative to a dress for evening events during the summer. If possible, I’d choose a different color rather than black for a fresher feel during the warmer months. Just add heels, a clutch and some statement jewelry and you’re good to go. Wide-legged jumpsuits can be very flattering, as you can cinch them at the waist. Chic and relaxed, you could wear with heels for summer daytime events, or with flats for a sightseeing vacation. 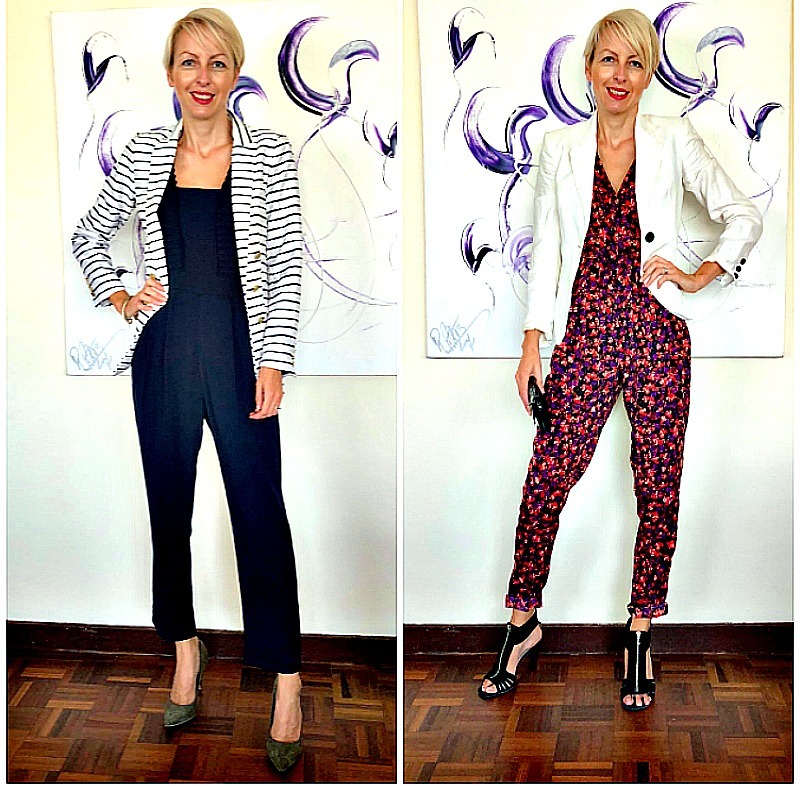 Most of the jumpsuits in my own closet are darker colors, so I tend to style navy and black jumpsuits for summer by wearing either a white or a striped blazer with them. The floral jumpsuit here is a silk mix so it’s nice and cool in hot weather. While it does have a black background, wearing all-over florals can be daunting, so I break it up by pairing with neutrals. There are lots of ideas to take you through to the colder months in this piece on jumpsuits for fall. Do you wear jumpsuits, or are you planning to add one to your wardrobe this summer for the first time? occasions, thank you, and so glad I found this website, wonderful ideas! Glad we’ve inspired you, and that I’ve found a fellow jumpsuit fan! Iskipped this post as I have had too many disappointmentw with jumpsuits. Being an inverted triangle shape it looks terrible on me. Such a shame.